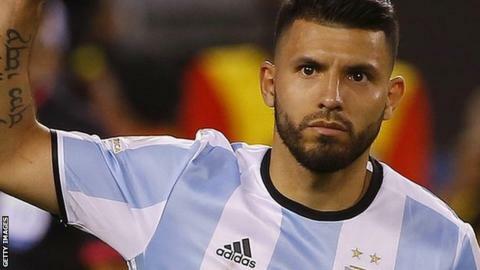 Manchester City striker Sergio Aguero has been ruled out of Argentina's World Cup 2018 qualifiers with a calf injury. The Argentina Football Association confirmed the 28-year-old picked up the injury during City's 3-1 Premier League win over West Ham on Sunday. No timescale has been given for his return, with Aguero potentially facing FA charges for elbowing Hammers defender Winston Reid. Argentina play Uruguay on Friday, before facing Venezuela on 7 September. Lionel Messi has also been training with Argentina after reversing his retirement decision, which was made at the start of August. However, the 29-year-old Barcelona man has suffered a hamstring injury ahead of travelling to South America and whether he plays "will depend on how the injury develops", according to his club. Argentina are currently third in the qualifying table after winning three of their six games.